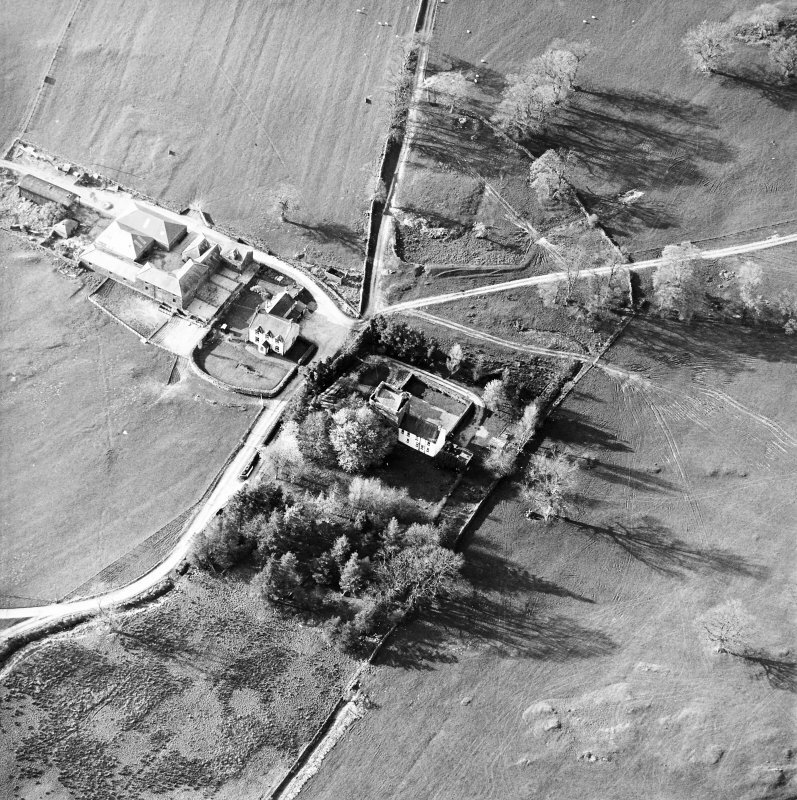 Oblique aerial view centred on the tower-house with farmsteading adjacent, taken from the NW. 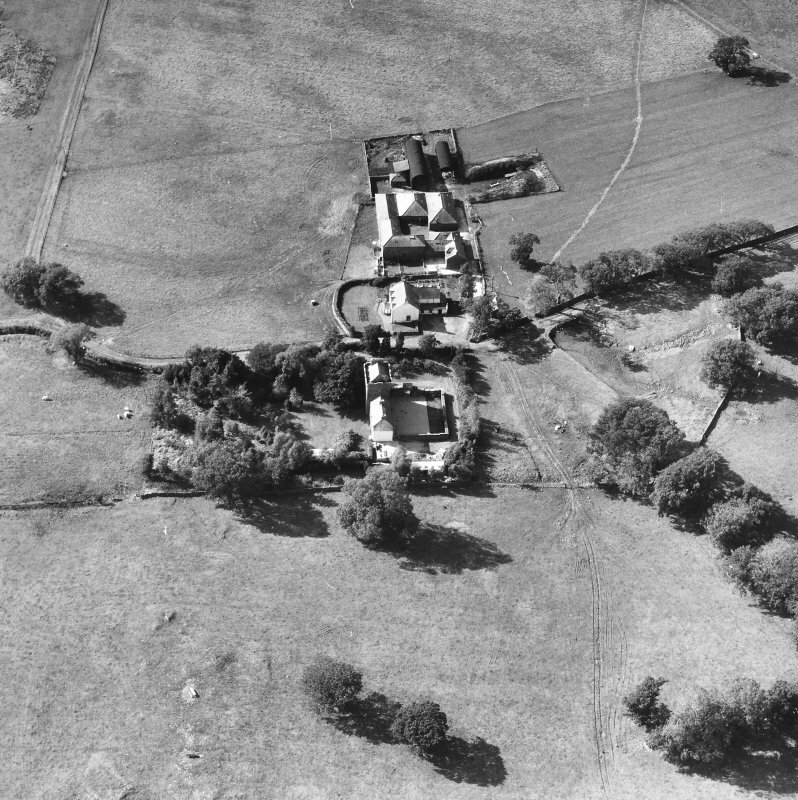 Oblique aerial view centred on the tower-house with farmsteading adjacent, taken from the NNW. 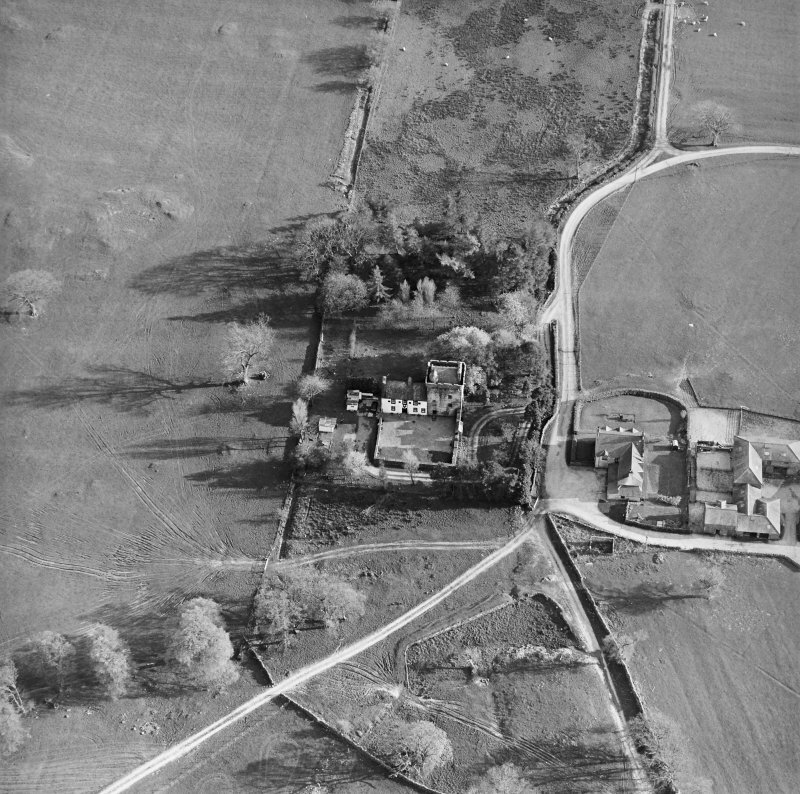 Oblique aerial view centred on the tower-house with farmsteading adjacent, taken from the NNE. 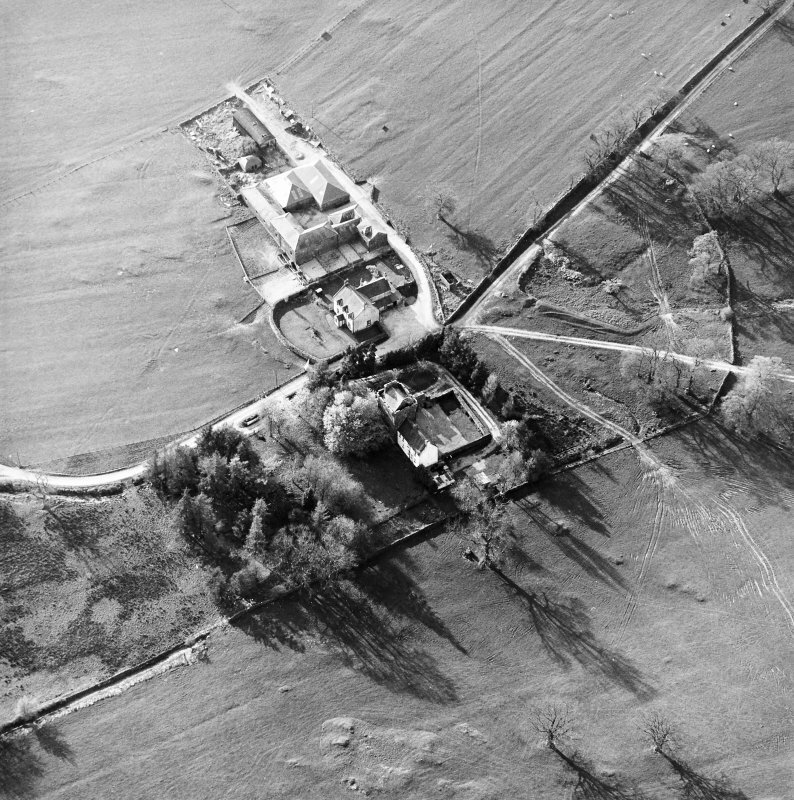 Oblique aerial view centred on the tower-house with farmsteading adjacent, taken from the ESE. 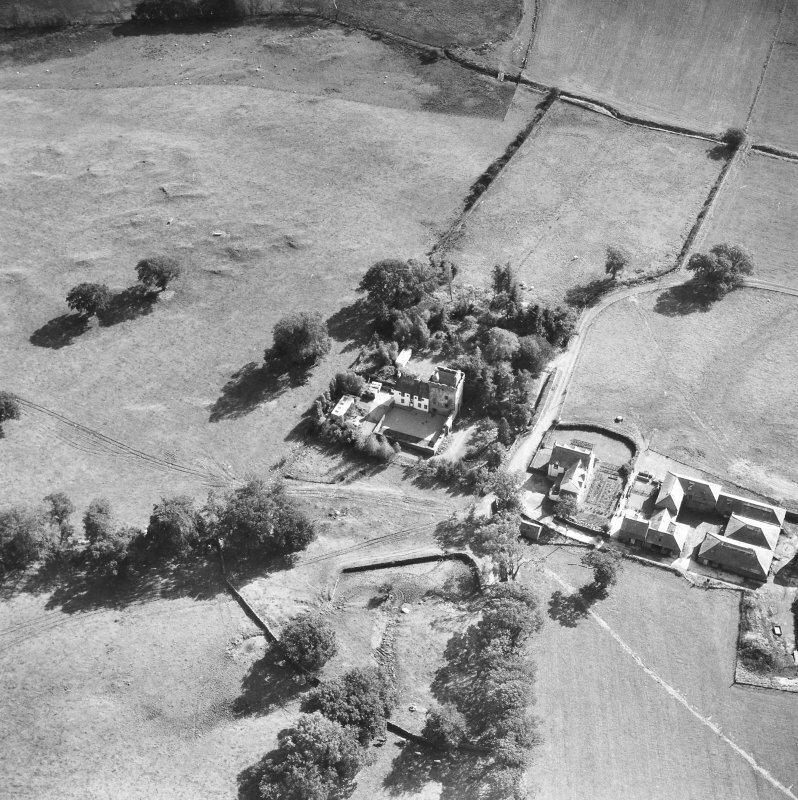 Oblique aerial view of Hills Tower, taken from the W.
View of Hills Tower from SE with haystacks in the foreground. 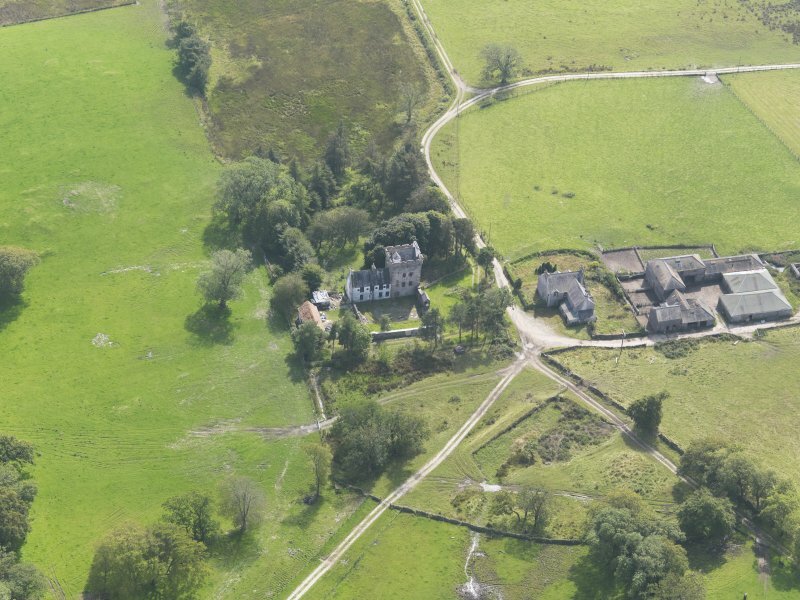 Oblique aerial view of Hills Tower, taken from the SSW. 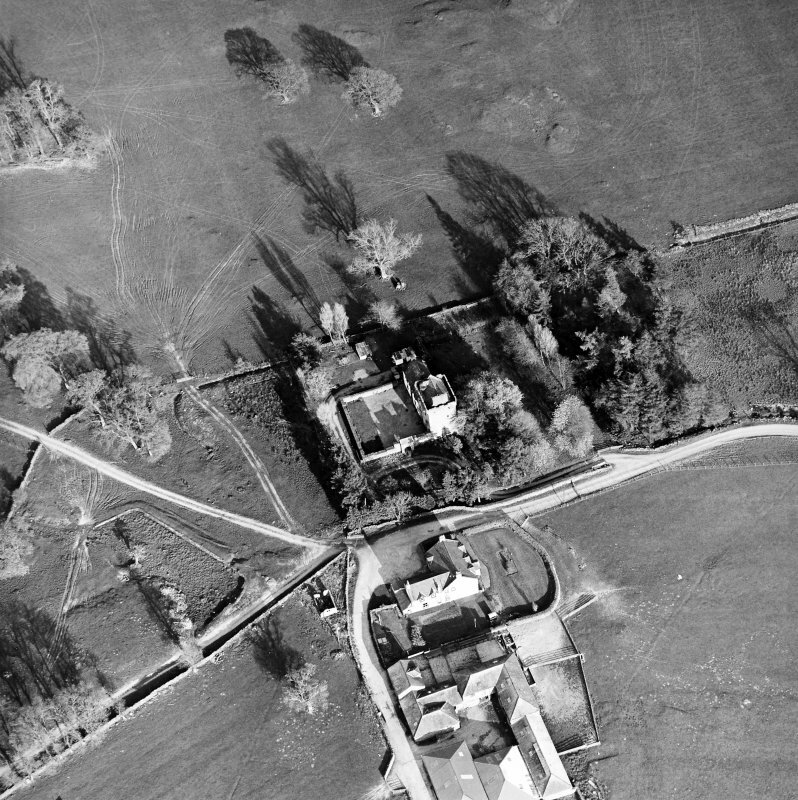 Oblique aerial view centred on the tower-house with farmsteading adjacent, taken from the WSW. 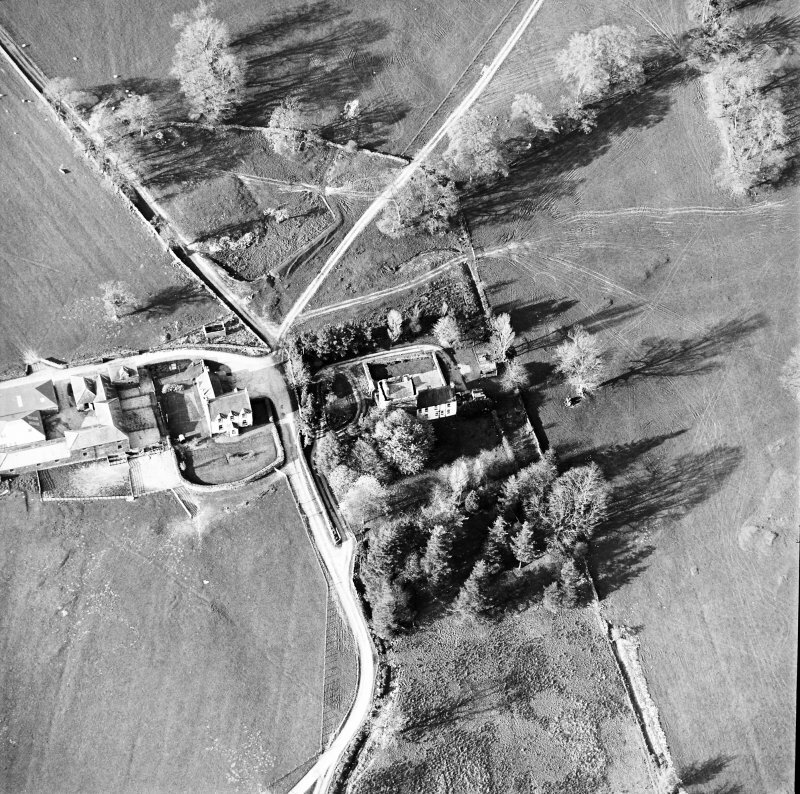 Oblique aerial view of Hills Tower, taken from the NNW. 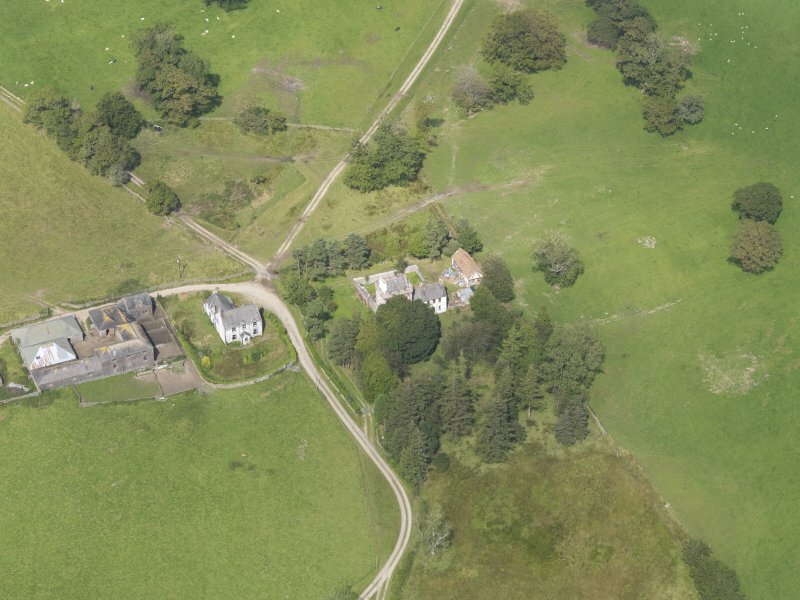 Oblique aerial view centred on the tower-house with farmsteading adjacent, taken from the SSE. 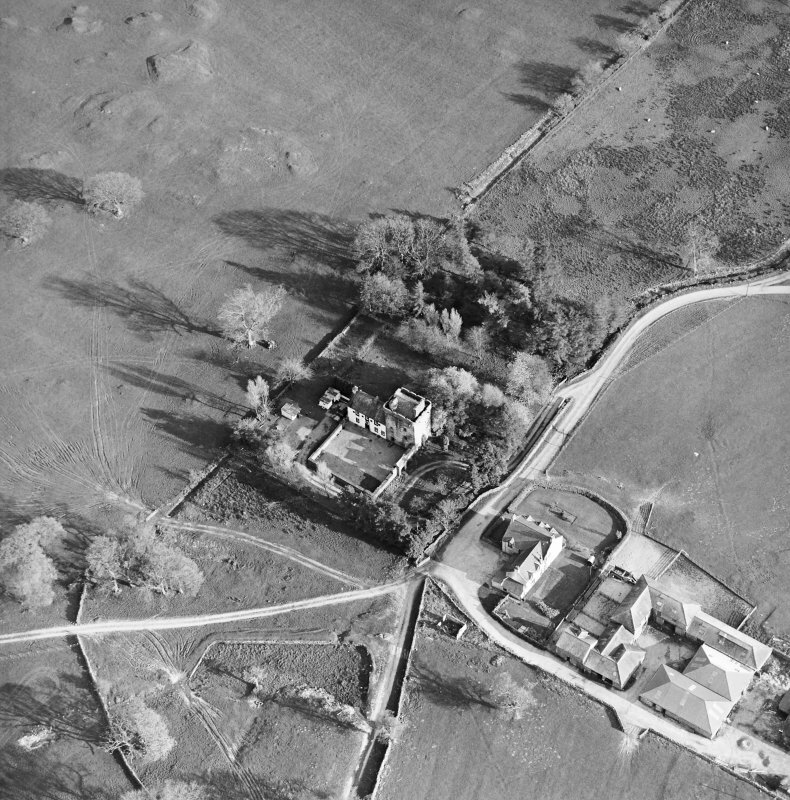 Oblique aerial view centred on the tower-house with farmsteading adjacent, taken from the SW.
Oblique aerial view of Hills Tower, taken from the WSW. 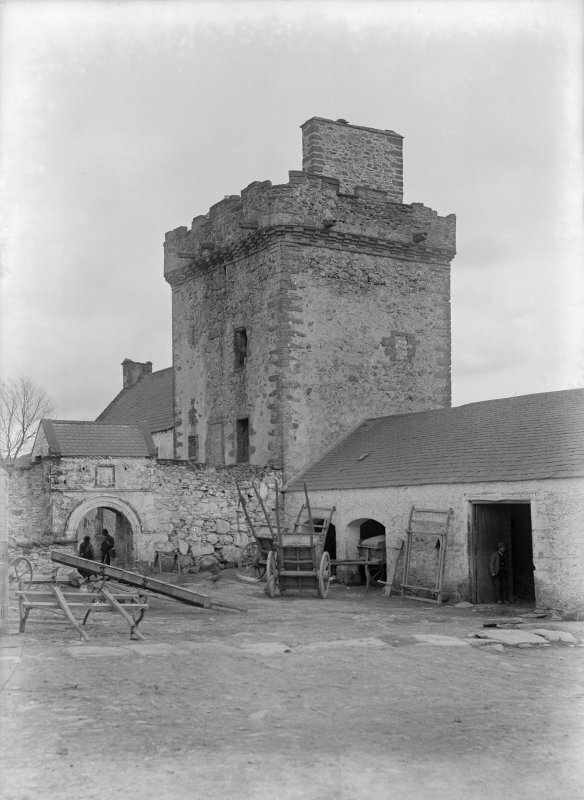 View of Hills Tower from NW. 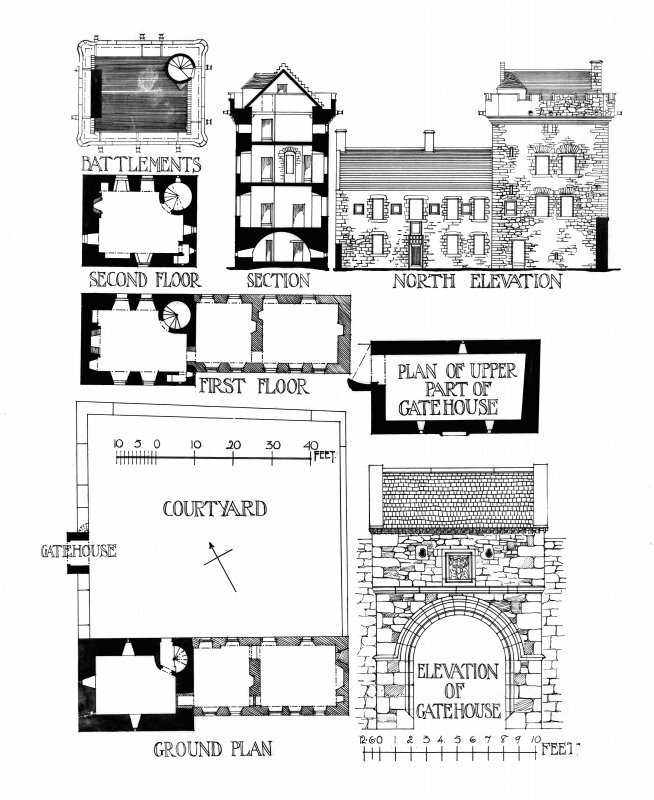 Drawing showing ground plan and elevation of Hills Tower gatehouse. 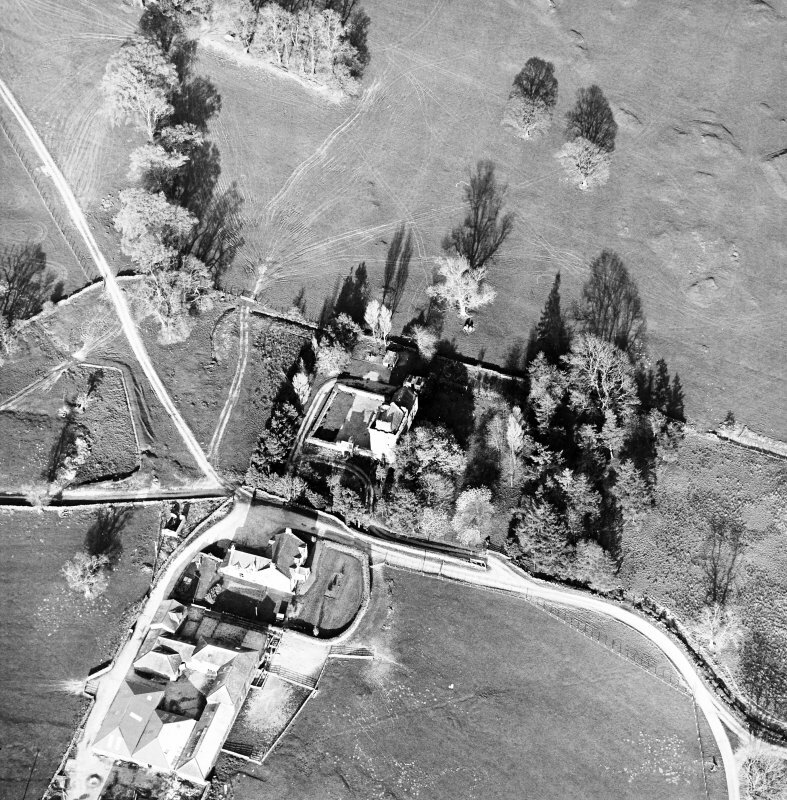 Oblique aerial view of Hills Tower, taken from the NE. 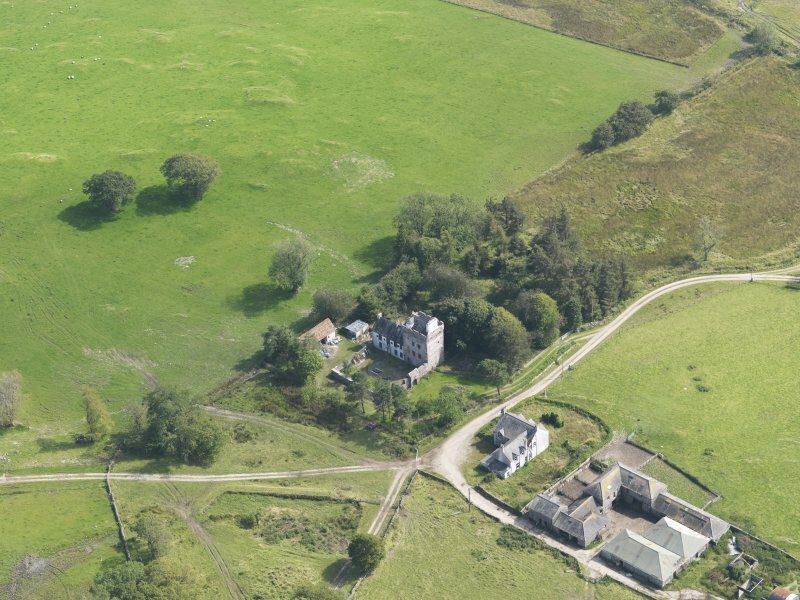 Hills Tower, built between 1528 and 1566, measures 23'7" by 29'9" and has been restored. 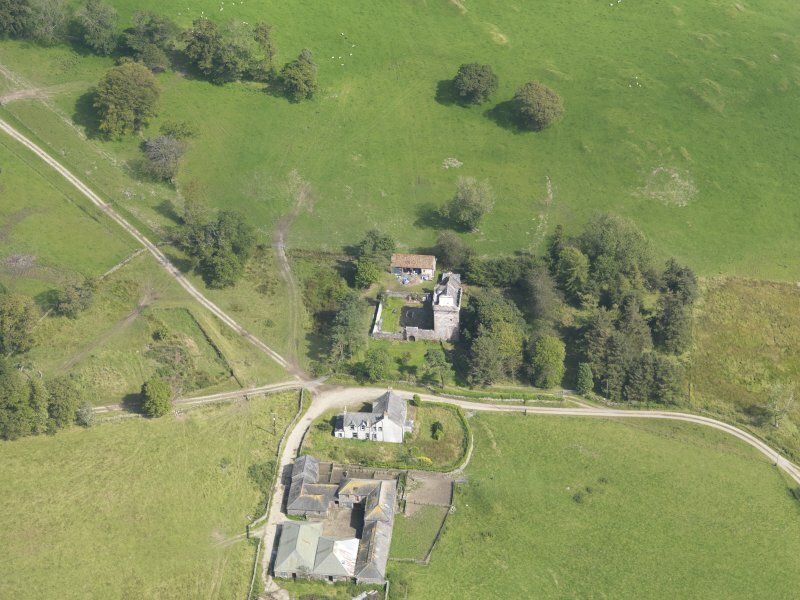 A wing, dated 1721, is attached to its E side. 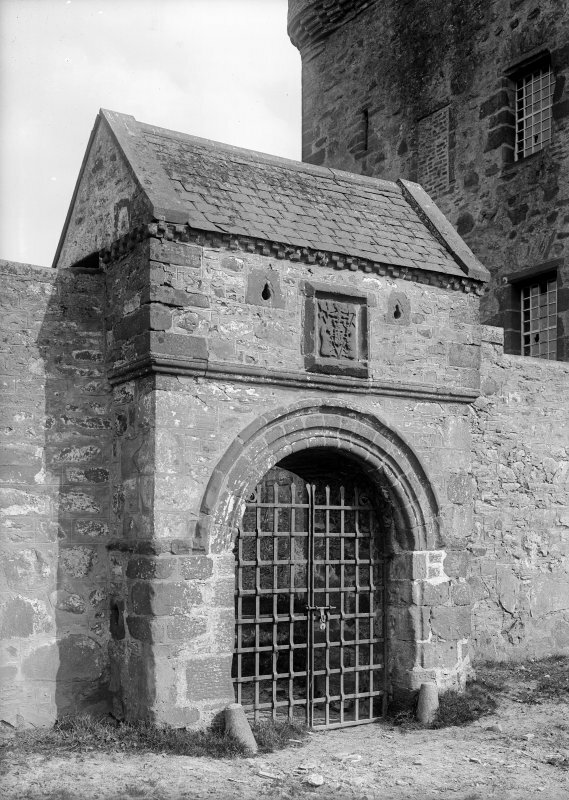 In the W side of the courtyard is a gatehouse probably dating from the first half of the 16th century. 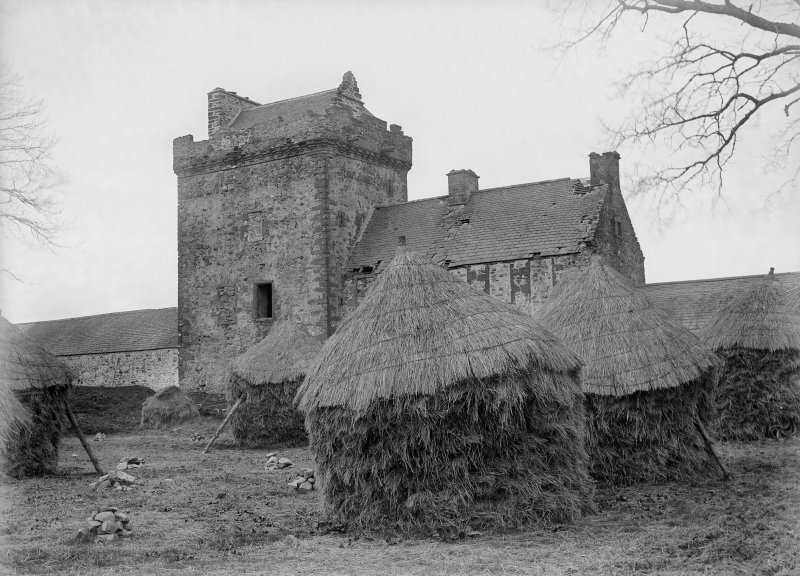 Hills Tower is as described and illustrated except that the steading, attached to the W side in the illustration has been removed. 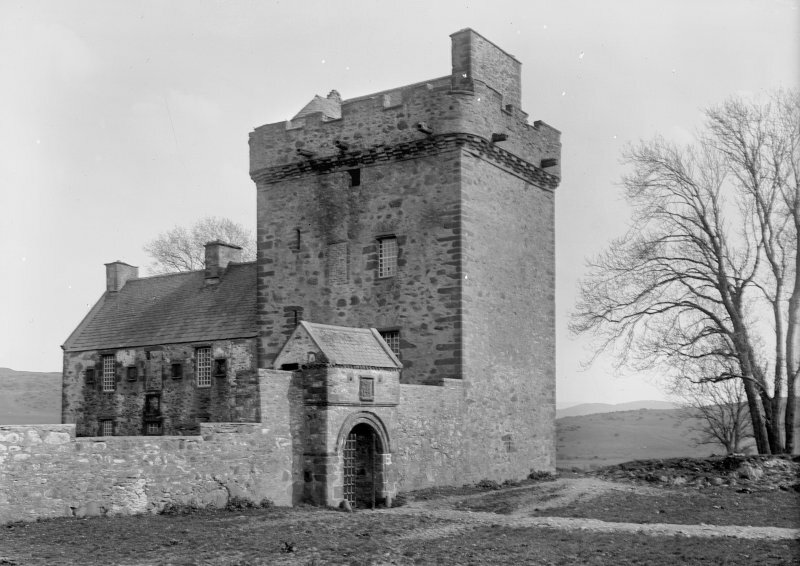 The wing on the E side is in use as a dwelling but the tower itself is unoccupied. 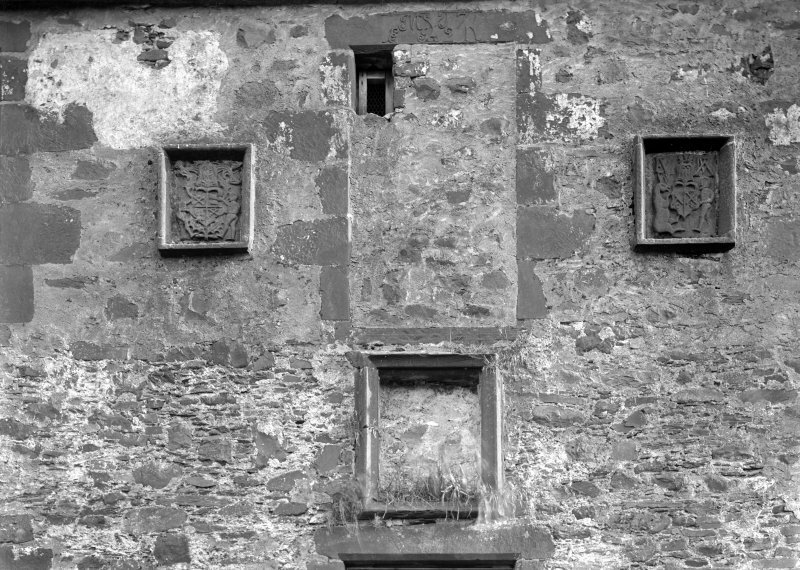 The whole structure is in a good state of repair. 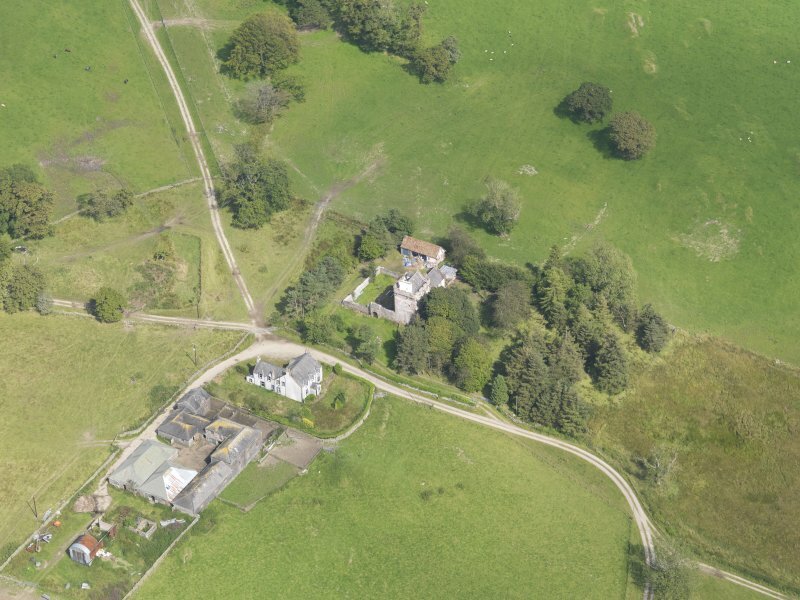 In carrying out restoration work plans of both the Tower (c. 1530) and the House (1721) have been prepared. 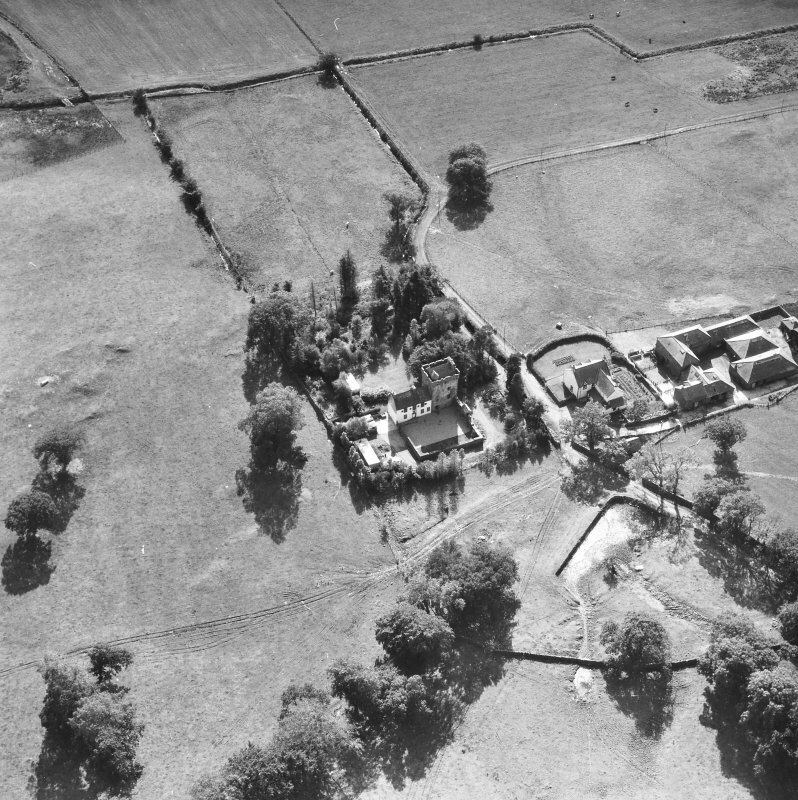 Copies of these plans are with the NMRS. 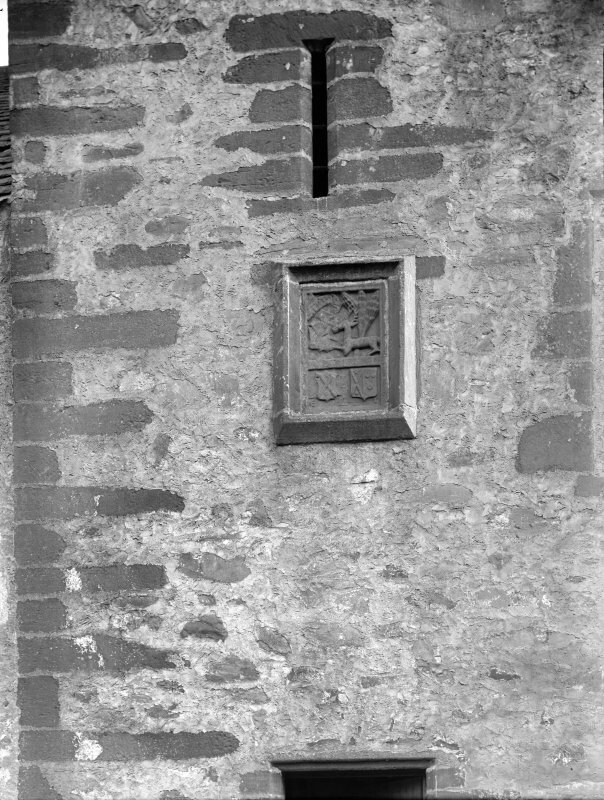 Three masons' marks have been recorded on the dressed freestone of the Tower. 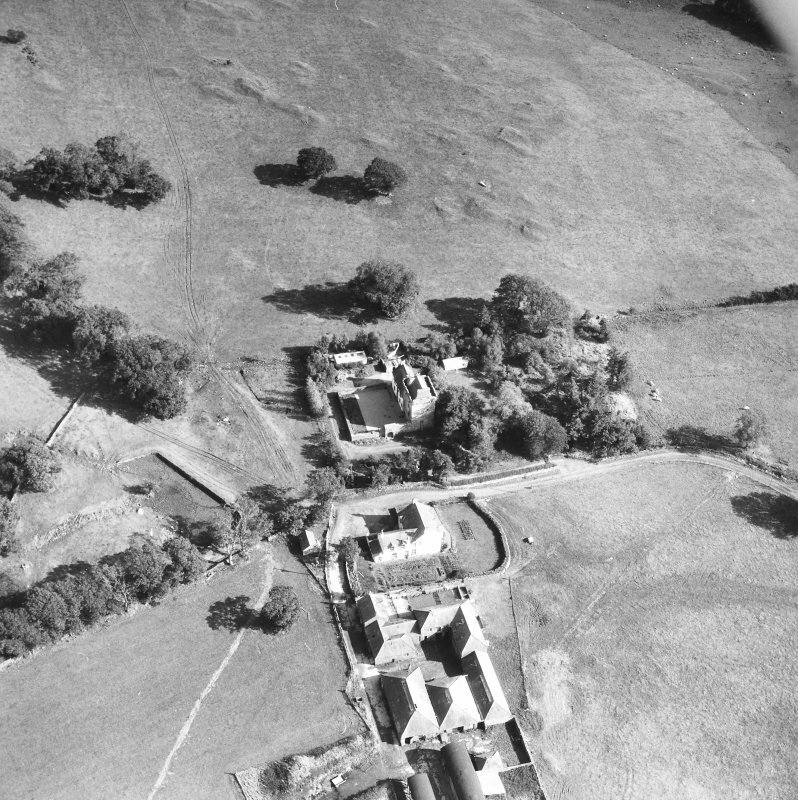 Both garderobes and their individual chutes have been uncovered. 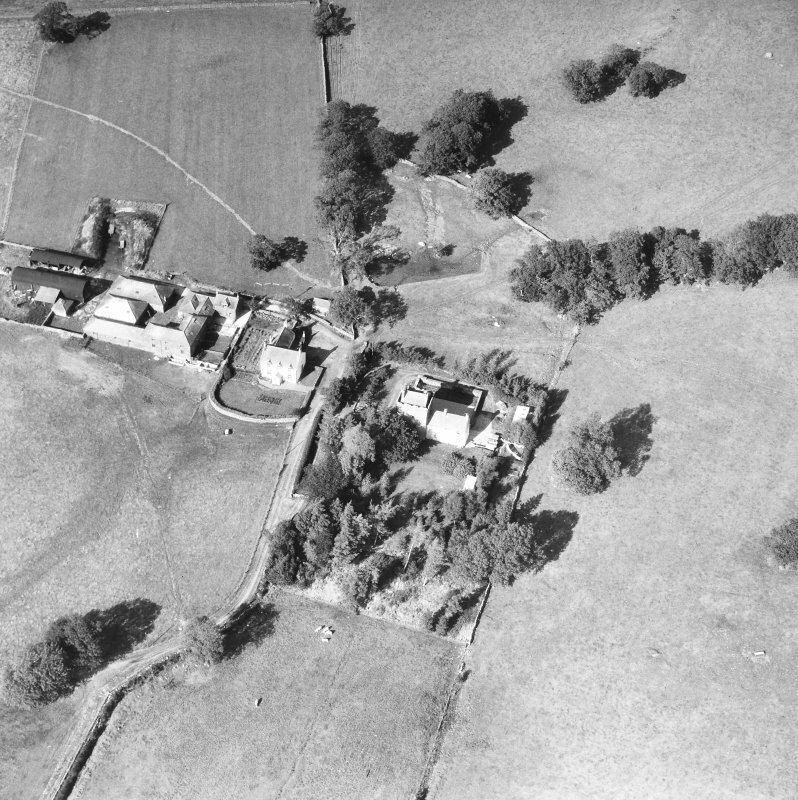 Finds recovered from the grounds include clay-pipe bowls and stems from the mid 17th - late 19th centuries; three fragments of late medieval pottery (15th - 16th centuries); several fragments of flint apparently used for the production of gun-flints; one small whetstone; and a small deep cobalt blue glass bead, possibly of early medieval date. 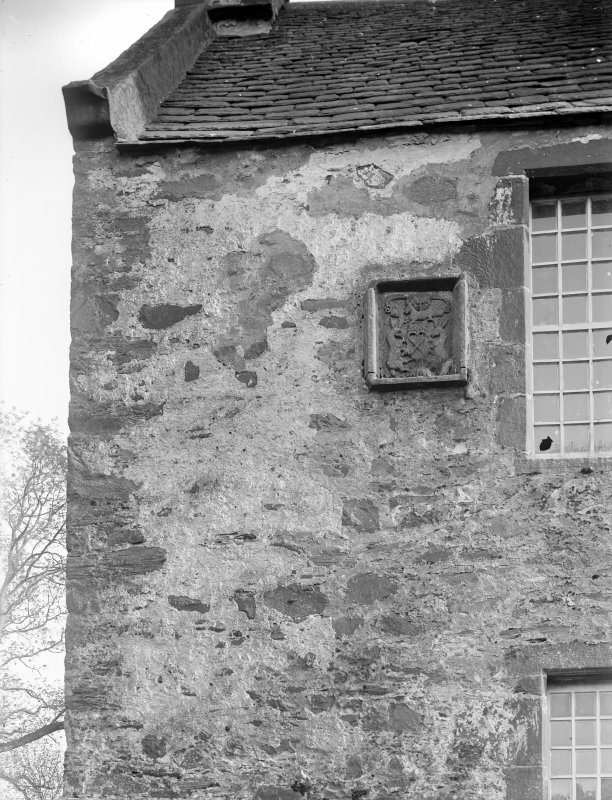 Architect: John Selchrig (Selkirk?) 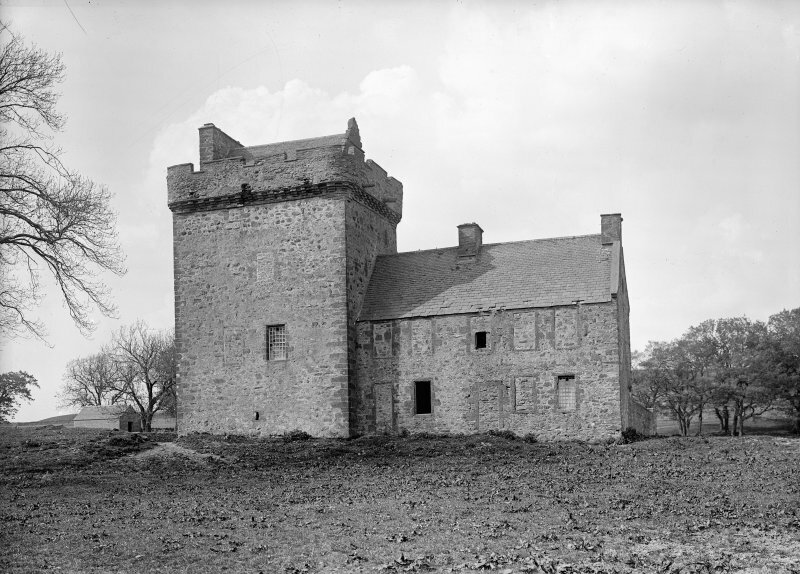 1721 - addition of house to tower.